Christine Klocek-Lim spends most of her time daydreaming—which isn’t much different from what she did as a girl in northeast Pennsylvania, as a college student in Pittsburgh, as a twenty-something technical writer in New York City, and as a young mother in suburban New Jersey. For the past decade or so she’s been dream-surfing in the Lehigh Valley of Pennsylvania. She’s published a pile of romance novels, a few poetry chapbooks, and a bunch of short stories. If you’d asked me that question ten years ago, I would’ve said that I collect words. I wrote only poetry at that time so my focus was on imagery and metaphor. When I had enough words, I formed them into a poem. Five years ago I would’ve said I think of a theme (astronomy, clouds, angels) and go from there. Three years ago I’d have told you that I write an outline, then work on a book chapter by chapter. Now that I’m focusing so much on novel-writing, I begin with my characters. I give them names and a history and something that affected them greatly in their past. When I’ve figured out who they are, I put them into a situation of conflict. The characters decide where to go from there. Just keep writing. I don’t recall hearing this at some point in time and having some sort of realization. Rather, it’s the advice that everyone says over and over again. The more you write, the better you get at it. It takes a long time to grow comfortable with your voice. If you want to improve your skill, the only way to do it is through practice. 3. Can you say a little bit about the genesis of Disintegrate? 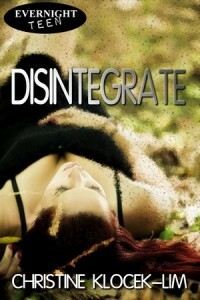 Disintegrate began with a scene that appeared full-blown inside my head: a girl lost by a river, at night. I knew that I wanted to write about what it felt like to be right on the cusp of adulthood, and since I love paranormal stories, I gave Felicity the ability to manipulate matter in a certain way. Of course, she has no idea why she can do this or how important it would be for her in the future. All she knows is that she’s lost, she’s cold and tired, and suddenly, she hears music. She finds her way to a bar where a young man is singing. Jax isn’t what she expects. He’s nice. He likes her. They immediately sense a connection, but nothing happens easily when you’re seventeen, does it? Yes. Lately, I’ve found that I don’t have much time to read anymore, and that’s been really strange. To suddenly go from reading two or three or more books a week to maybe two in a month has been extremely frustrating. On the other hand, the stories in my head have been clamoring louder and louder the older I get. I want to write them down. I want those characters to be heard. This is one of those trick questions, right? It’s both! Of course it is both. I didn’t start writing novels until I hit age forty, so I had a long time to learn about life. Even so, as I began to fool around with characters and conflict and narrative, I learned that to write from a character’s point of view required me to learn how to see things from outside my usual frame of reference. I needed to become the characters in order to write their voices and decisions into a novel. I’ve been writing poetry since I was a child, and while it is a demanding and exacting art, I found that I didn’t bother with other people’s perspectives as much when writing poems. I love what I’ve learned by tackling another form of writing. This was written by joannemerriam. Posted on Friday, May 17, 2013, at 12:33 pm. Filed under Fiction, Um... yeah. Tagged Christine Klocek-Lim, Intermittent Visitors. Bookmark the permalink. Follow comments here with the RSS feed. Both comments and trackbacks are currently closed.